There are three forms of tumoral calcinosis: 1) SPORADIC (nonfamilial; idiopathic) � seen in otherwise healthy children and young adults, it consists of large solitary asymptomatic subcutaneous tumor-like calcified mass near a large joint (usually hip, shoulder, elbow). The lesion is attached to the underlying fascia, muscle, or tendons. The associated joint and bones are not involved. 2) FAMILIAL TUMORAL CALCINOSIS � presents as multifocal lesions associated with bony, ocular and dental abnormalities. It is seen more commonly in young African-American patients. The hyperphosphatemic variant is linked to mutations in GALNT3, FGF23, or the KL gene and is associated with elevated serum phosphate and Vitamin D levels. The normophosphatemic variant is associated with abnormalities in SAMD9 - a tumor suppressor gene. 3) SECONDARY TUMORAL CALCINOSIS � abnormal calcium deposition can also occur in disorders such as secondary hyperparathyroidism due to chronic renal failure, primary hyperparathyroidism, sarcoidosis, systemic sclerosis, and destructive bone lesions caused by metastases or infections. The patients are usually elderly and show abnormal calcium deposits in heart, lung, kidney, and stomach as well. 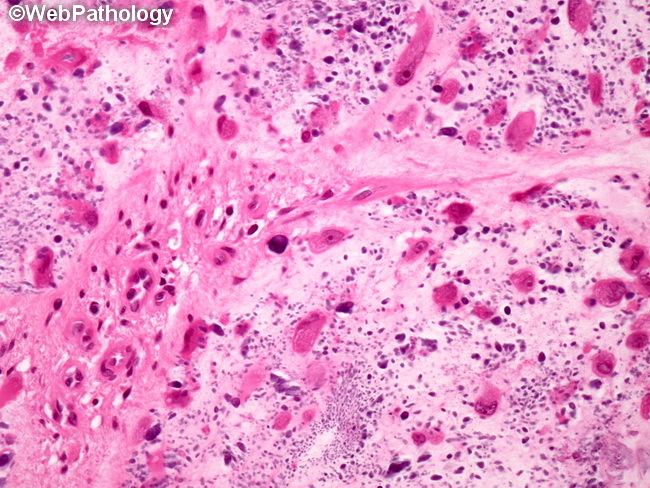 The image shows numerous macrophages and granular calcium deposits in a background of dense fibrous tissue in a case of familial tumoral calcinosis.